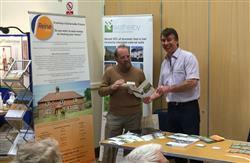 Rural Kent (Action with Communities) held another sucessful workshop convention at Lenham Village Hall where over 90 delegates representing 50+ community centres were in attendance. Dan Large & Peter Graham (pictured) were up early for a Saturday and happy to contribute by performing a Powerpoint session on “ways to save energy”, which according to feedback went down very well. Daniel (Reina Group Technical Director) spoke of the benefits of getting the fabric right first and then of the cost saving benefits of installing the correct controls and heating system for the particular building. As approved installers of both Air & Ground source heat pumps we did have a slight bias towards this innovative technology and explained the financial benefits to both domestic & Non-domestic scenario’s via the RHI (renewable heat incentive). Peter can be seen here talking with a delegate about EWI (external wall insulation) that the Reina Group are now promoting after the acquisition of Beaumont Facades.